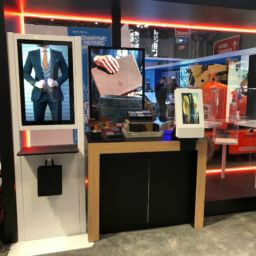 Meridian’s mBOX provides secure, kiosk-managed storage to simplify product pickup for unattended equipment rentals, device charging, package drop off and retrieval, and much more. Meridian’s automated smart locker system increases order capacity by streamlining the order and pickup processes. By streamlining the pickup process, the smart locker decreases store congestion and eliminates long wait lines. The smart locker system increases customer satisfaction by creating a time efficient solution for product storage and/or pickup. Meridian’s automated, smart locker system reduces overhead costs by increasing order output without increasing costs. 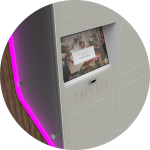 The automated locker system allows customers to order and pay for their meal online or in-app. 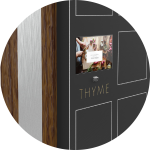 Once the customer’s order is placed and completed, the meal is placed securely in the automated locker system. When their food is ready, customers can skip the line and pick up their order directly from the locker system by using a QR code or pin number. The automated locker system allows customers to order and pay online or in-app. Once the order is placed and fulfilled, the product is placed securely in the automated locker system. When customers are ready, they can skip the line and pick up their order directly from the locker system by using a QR code or pin number. The automated locker system provides secure, kiosk managed storage for products and/or belongings. 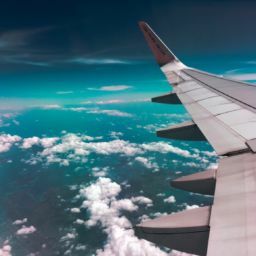 For example, travelers on long layovers can pay to store their carry on baggage and duty free purchases securely in the locker system until it’s time to board their flight. The automated locker system securely stores equipment for convenient rental. 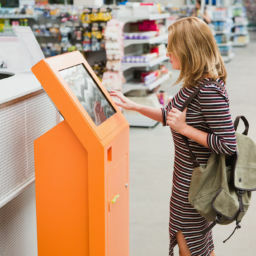 Customers can pay for and schedule their rental online, in-app, or at the kiosk-managed locker system. When the rental period is over, customers can return the equipment to the secure locker system. 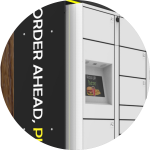 The automated locker system is a great solution for package drop off and pickup. Delivery services can store packages securely in the locker system for customers to pick up at their own convenience by scanning their QR code or entering their assigned pin number. The mBOX is built using cabinet modules. Choose the height, width, depth and locker size that best fits your needs. The mBOX automated locker system offers multiple screen sizes to fit each use case. The mBOX offers custom side panels including LED lighting, Lexan lamination, and wood veneer wrap. 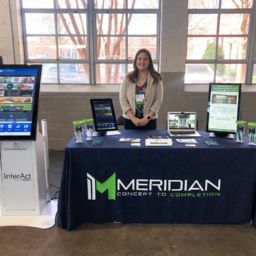 Meridian is an end-to-end kiosk manufacturer capable of executing almost any modification imaginable.